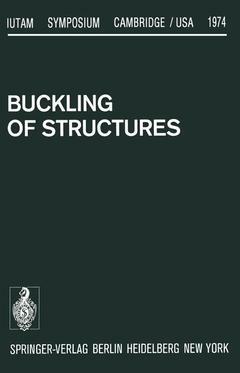 This volume contains the written texts of the papers presented at a Symposium on Buckling of Structures held at Harvard University in June 1974. This symposium, one of several on various topics sponsored annually by the International Union of Theoretical and Applied Me­ chanics (IUTAM), was organized by a Scientific Committee consisting of B. Budiansky (Chairman), A. H. Chilver, W. T. Koiter, and A. S. Vol'­ mir. Participation was by invitation of the Scientific Committee, and specific lecturers were invited to speak in the areas of experimental research, buckling and post-buckling calculations, post-buckling mode interaction, plasticity and creep effects, dynamic buckling, stochastic problems, and design. A total of 29 lectures were delivered, including a general opening lecture by Professor Koiter, and there were 93 reg­ istered participants from 16 different countries. Financial support for the symposium was provided by IUTAM, in the form of partial travel support for a number of participants, and also by the National Science Foundation, the National Aeronautics and Space Administration, and the Air Force Office of Scientific Re­ search, for additional travel support and administrative expenses. Meeting facilities and services were efficiently provided by the Science Center of Harvard University, and administrative support was gen­ erously provided by the Division of Engineering and Applied Physics of Harvard University. The scientific chairman enjoyed the invaluable assistance of his colleagues Professors J. W. Hutchinson and J. L.
I. Opening Lecture.- Current Trends in the Theory of Buckling.- II. Buckling and Post-Buckling Calculations.- Critical Buckling Loads of some Prismatic Plate Assemblies.- On the Collapse Load of Cylindrical Shells.- Finite Element Representations for Thin Shell Instability Analysis.- Computer Solutions for Static and Dynamic Buckling of Shells.- III. Plasticity and Creep.- Theory and Experiment in the Creep Buckling of Plates and Shells.- Nonsymmetric Creep Buckling of Cylindrical Shells under Axial Compression and External Pressure.- Creep Instability of Thick Shell Structures.- A Plastic Flow Rule at a Yield Corner.- Analytical and Numerical Study of the Effects of Initial Imperfections on the Inelastic Buckling of a Cruciform Column.- Stability Analysis of Rigid Plastic Structures at the Yield-Point Load.- IV. Mode Interaction.- Mode Interaction with Stiffened Panels.- An Alternative Approach to the Interaction between Local and Overall Buckling in Stiffened Panels.- An Experimental Study of Imperfection-Sensitivity in the Interactive Buckling of Stiffened Plates.- Mode Interaction in an Eccentrically Stiffened Elastic-Plastic Panel under Compression.- V. Stochastics.- Buckling of Stochastically Imperfect Structures.- Reliability of Slender Columns: Comparison of Different Approximations.- Some Statistical Aspects of Coupled Buckling Structures.- VI. Dynamics.- Some Remarks on Liapunov Stability of Elastic Dynamical Systems.- An Investigation of the Stability and Vibration of a Hyperbolic Shell of one Sheet under Axisymmetric Loading.- VII. Experiments.- The Influence of Boundary Conditions on the Buckling of Stiffened Cylindrical Shells.- The Effect of Shape Imperfections and Stiffening on the Buckling of Circular Cylinders.- Calculated Postbuckling Loads as Lower Limits for the Buckling Loads of Thin-Walled Circular Cylinders.- Prediction of Buckling Loads Based on Experimentally Measured Initial Imperfections.- Experiments on the Postbuckling Behavior of Circular Cylindrical Shells under Torsion.- VIII. Design.- Design Philosophy in Structural Stability.- Design of a Mars Entry “Aeroshell”.- Interaction between Local Plate Buckling and Overall Buckling in Thin-Walled Compression Members—Theories and Experiments.- Buckling Design in Ship Structures.